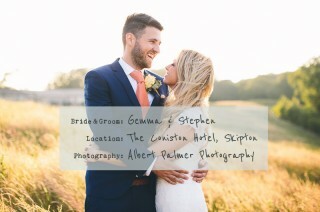 There’s nothing quite as delicious as portrait shots backlit by that wonderful luminous light taken as the sun goes down and Carolyn and Tim’s wedding has that in spades. Heavenly! 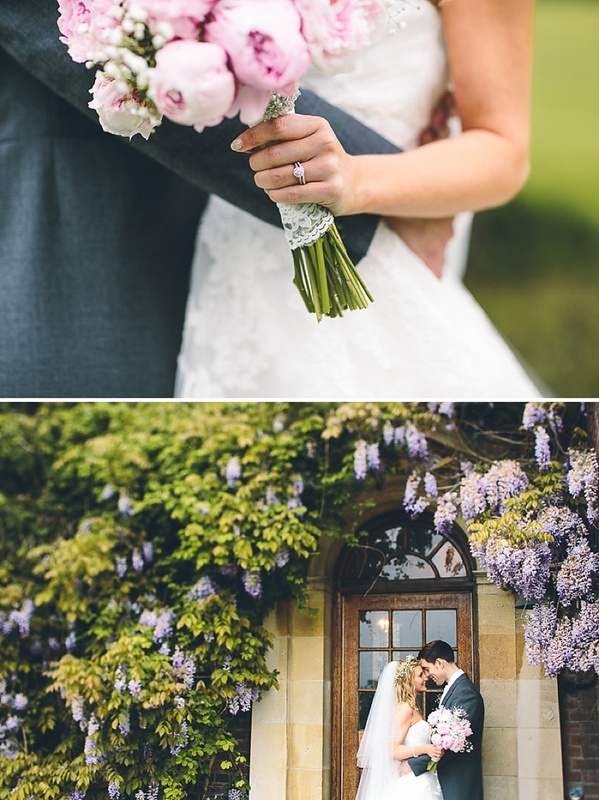 This smiling duo married at Coombe lodge amongst rolling lawns and mature trees with an oh so elegant theme complimented by pink bridesmaid dresses, peach and creamy vuvuzela rose bouquets and Carolyn’s glossy locks. And they are glossy, all thick and perfectly groomed – the perfect complement to her lace & crystal headband which I quite want myself! 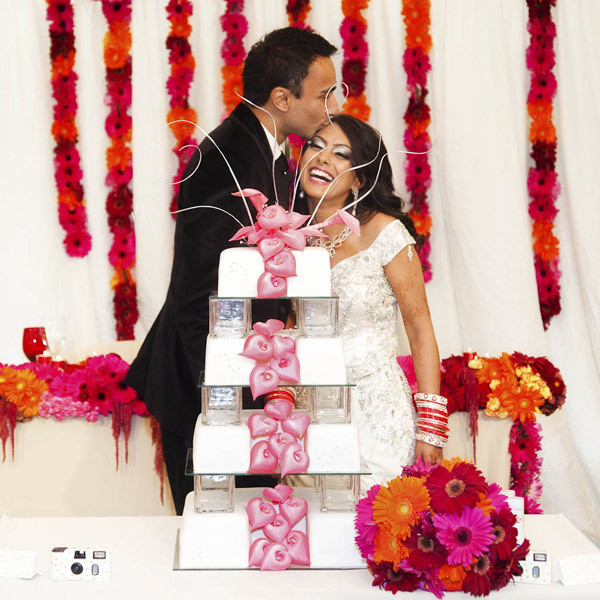 You also need to check out the awesome cupcake tower complete with DIY flag toppers (check out our own DIY flag topper project if you’re after something similar) and Carolyn’s beautiful Pronovias dress. 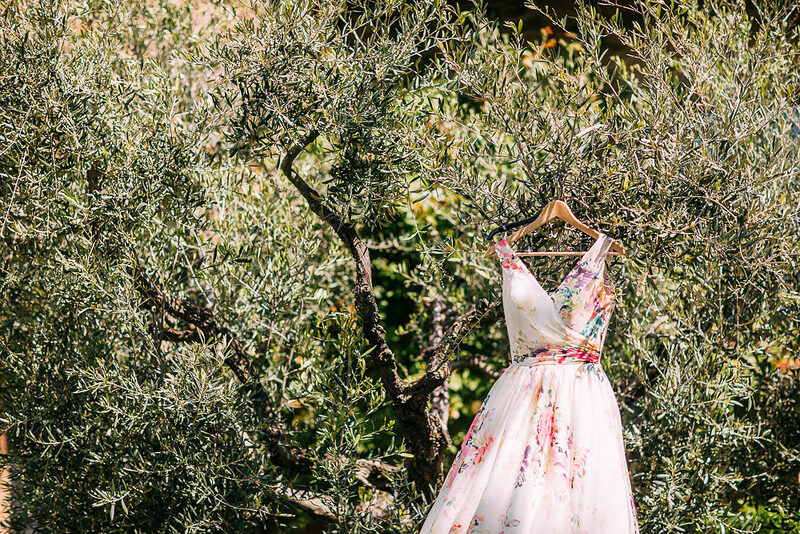 It is a very pretty wedding indeed and as you’ll see from Emma’s write up – the day and the whole wedding managed to out-do all of those childhood dreams, even when things didn’t go as planned, like her epic dress hunt for example. However tight finances meant a weekday wedding was the ideal and the dream church was ruled out. 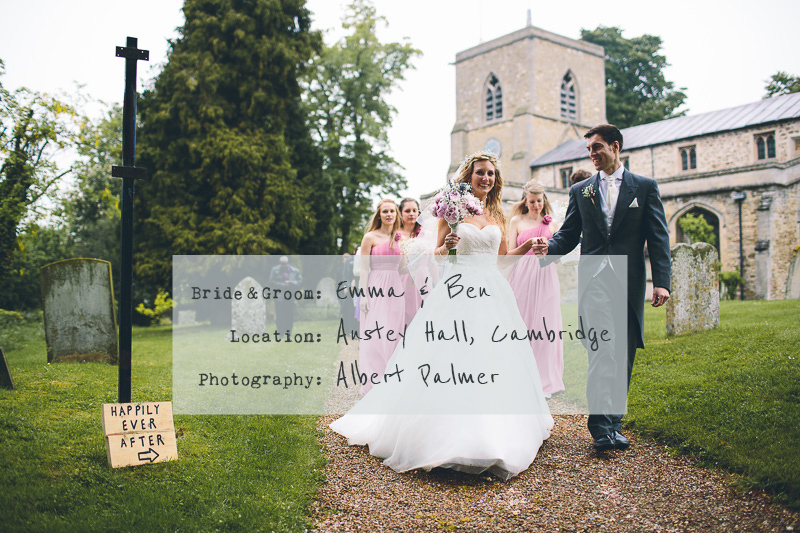 Instead, a beautiful rural village church on the River Cam was decided upon and the rather tantalizing Anstey Hall was booked for 30th May 2013. 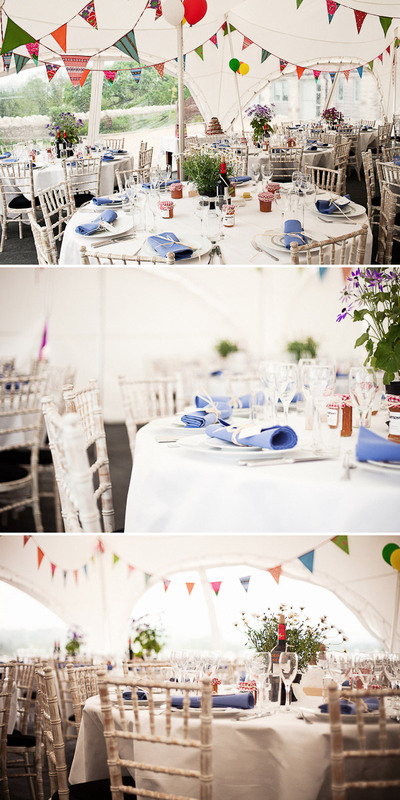 A beautiful family home, exclusively ours for the day and with a marquee I could get my creative hands on. I have never been a ‘hair up’ girl and wanted to look as much like ‘me’ as possible on my Wedding Day…however I knew I wanted to feel special and so I was after something a little different to my usual ‘long and straight’ style. After a bewildering hunt through every hairstyle image I could find my mum came to the rescue. My mum was a complete superstar throughout the wedding planning. I would mention an idea and before I knew it she would have sourced how to make it at the cheapest cost, contacted the relevant the businesses/suppliers and it would be on our kitchen table the next day – no exaggeration! Therefore in the blink of an eye (maybe not literally!) a number of hair tongs arrived through the post and early morning hair style trials became our weekly girl time together. We quickly settled on American hair crimpers (they are amaaaazing!) and Mum became my Wedding Hair Dresser just like that. It was a Taylor Swift-esque look (Ben’s second choice of wife :P) and I finished the look off with my dream gypsophila flower crown. I have always feared ‘fake tan’ but after seeing a photo of myself a month before the wedding looking like a ghost, I decided it was time to face the fear! I did lots of research and discovered a tanning brand called Sienna X which apparently did not streak and looked natural, not orange and without the digestive biscuit smell (not ideal for your wedding perfume!) It really is an amazing tan. After trialing it for my Hen Do, I was hooked! I also decided to get fake lashes…I knew I would worry about mascara running if I shed a tear (or three!) Mink Lashes are a girls dream – they look and feel very real (and coming from a girl who usually wears very little make up, I think I might be addicted!). Magui is the best make up artist a Bride could wish for. Fact! I wore the same nail polish as Catherine Middleton did on her wedding day – Allure by Essie. I decided that it would be nice to have a ‘bridal party scent’ so my mum, bridesmaids and I all spritzed ourselves with Christian Dior’s – Miss Dior. Delicious! I remember reading in a wedding magazine that the average bride shall go into 4 wedding dress shops and try on a total of 20 dresses before finding ‘the one’…I feel rather ashamed to say that it took a total of 13 dress shops (and I couldn’t tell you how many dresses!) to find ‘MY one’. BUT golly gosh was it worth it! I found my ‘dream dress’ in Cambridge, however it had straps. Mum did her predictable, yet amazing internet hunt and found the same designer did the exact same dress, minus straps…however said dress was only available in one shop a couple of hours away. We drove to Chobham Bride in Surrey to try said dress and the first dress I saw as I walked into the shop (different to said one) was THE ONE!! I fell in love. It is called Toscana by White One. I have decided to have an annual ‘wedding dress tea party’ with my girlfriends just so it can be worn again and again and again!! My favourite two accessories were my Gypsophila Crown (made by mum) and my great great grandmother’s sapphire and diamond engagement ring. It had been passed down the family over the years and was lent to me for the day: my something blue, borrowed and old – all in one!! I have difficult feet, and although I love shoes, comfort was my key for the day. Amazon, I am surprised to say, was amazing for buying and returning shoes without any extra cost (free delivery and returns are ace!) 40+ shoe trials later I found Van Dal Origa… little heel, slightly wider, pretty and squishy = happy toes! I am a pink girl at heart and I think everyone knew I would go for ‘pink’ dresses…but sage green was on the agenda for a good while, I’ll have you know! The Bridesmaid dresses were from Girls of Elegance and the suits were from Moss Bros.
We didn’t want our wedding to be ‘matchy matchy’ in regard to colour. Although I love the colour pink, the idea of having pink favours, pink chair cover bows, pink pew ends etc etc made me feel a little sick. Instead the natural look was decided upon. I would often say I wanted to ‘bring the outdoors in’. I liked the idea of ivy, gypsophilla, hessian, wood and lace featuring heavily and that is what we did. My bouquet blew me away. It was the bouquet of my dreams – my mum’s best friend created it for me after I showed her a photo online. 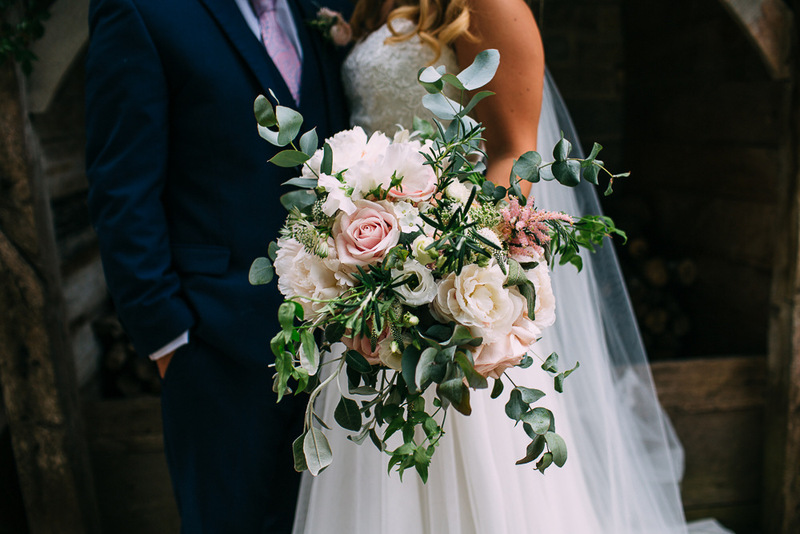 I explained to her that I would like it to look ‘picked from a field’ rather than ‘set and bridal’ and told her my favourite flowers were gypsophila, lavender and pink peonies. She did an incredible job, not just on my bouquet but the entire venue. She and my mum did all the flowers themselves: from the church pedestals (that looked like a soft cloud of gypsophila, the gypsophila pew ends tied with raffia and lace, the ivy and hearts hung around the marquee, to the hessian and lace jars filled with more gypsophila and lavender for the tables. I think they should team up and create a wedding florist business! For us this was the most important part of the day. Vowing to love Ben with every ounce of my body in front of God and all our family and friends… just wow! 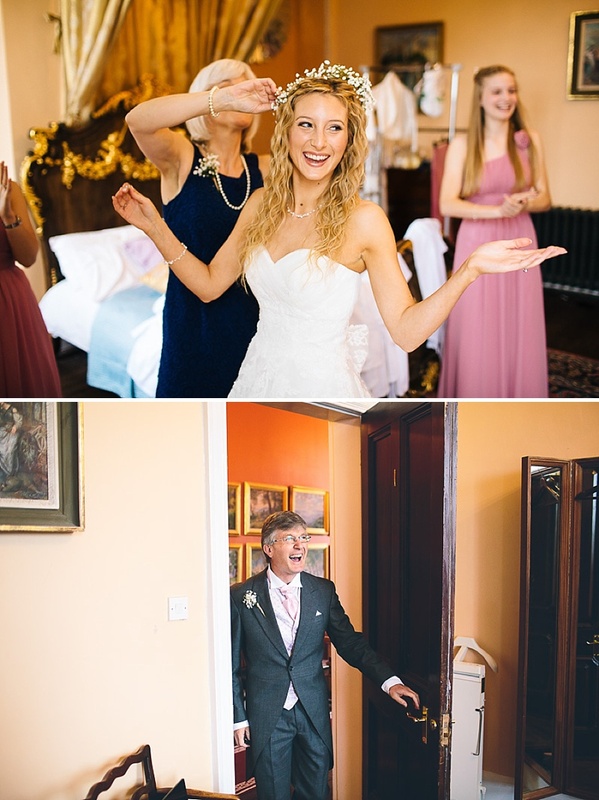 I’ll always remember locking eyes with Ben as I headed down the aisle… I’ll also unfortunately remember getting the giggles with my Dad as I stopped to pick my dress up from under my feet – remember to practice walking in your dresses girls!! Our service was full of love, joy, praise and emotion and was made extra special as my Grandfather married us! We wanted to have as many friends involved in the service as possible; one of my bridesmaids husband is the worship leader at our church, so he was Mister Amazing at converting the village church with traditional organ into a place where our worship band could rock the rather special building! Drums, bass and all! Our Groomsman’s wife sang Beyonce’s ‘Ave Maria’ and Dave Barnes ‘God Gave me You’ whilst we signed the register, a friend of the family gave our talk and my Godfather played us out of the church on the organ whilst the church bells rang triumphantly! Doesn’t every girl dream of that day confetti is thrown over her and the love of her life?? It certainly was a perfect moment as we walked through a scented rainstorm of petals to the cheers and applause of all our family and friends. 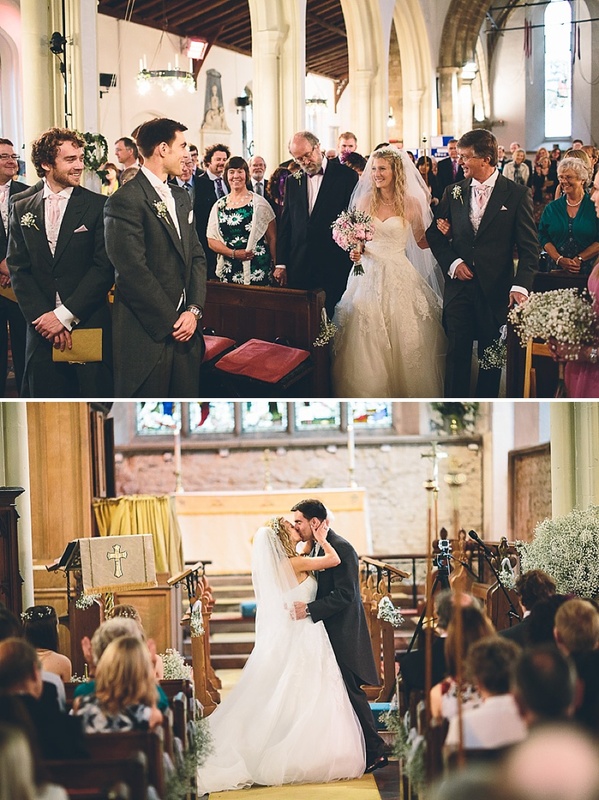 We bought our confetti from Shropshire Petals – they smelt so good! 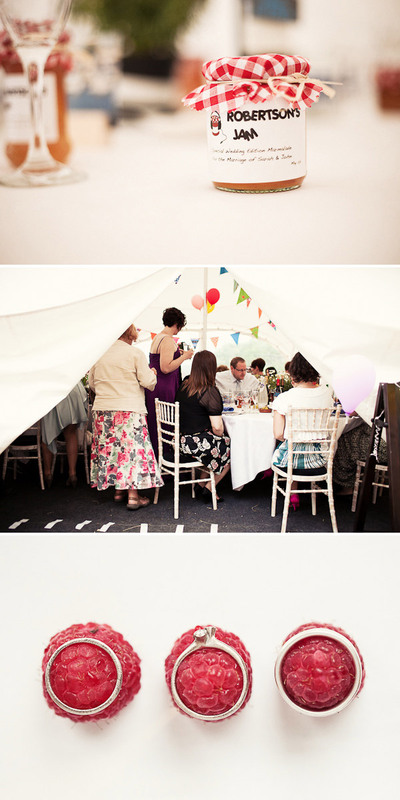 We had a homemade photobooth, paper aeroplane competition and lawn games throughout the day. 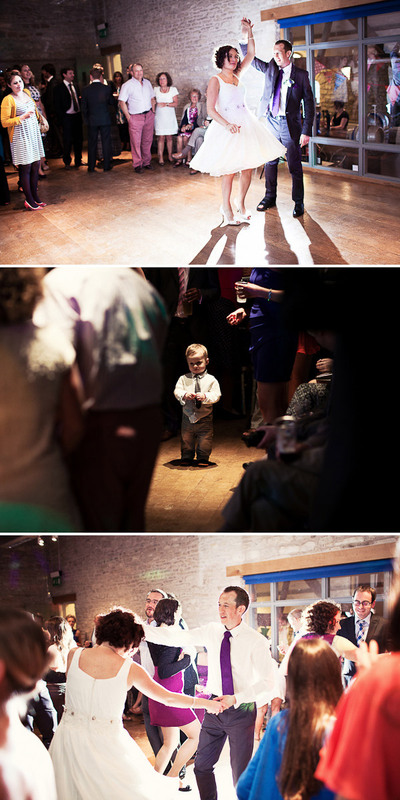 As a 5 year old bridesmaid I attended my Aunt and Uncle’s wedding reception; a barn dance in my Grandparents garden. I decided at that moment that when I got married I would do the same! 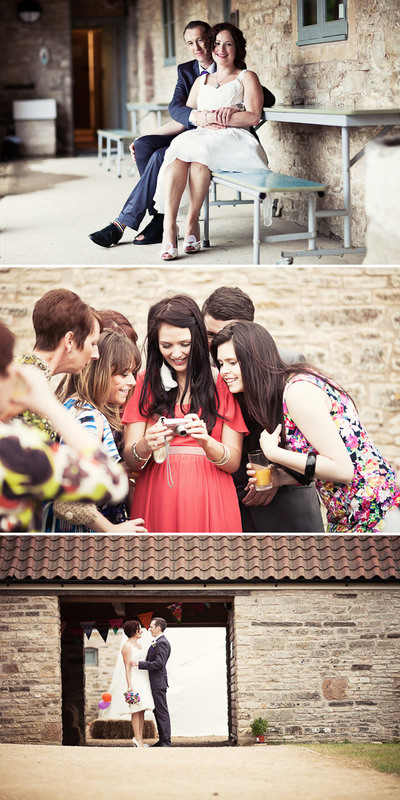 It may not have been in my Grandparent’s garden, or outside… but boy did we have a barn dance!! Mindset Ceiligh Band and their Caller were amazing and we could not recommend them enough! Our first dance was performed by my bridesmaid (Emily) and her husband (Ed) on acoustic guitar. We asked them to sing ‘Everything has Changed’ by Taylor Swift and Ed Sheeran, a song that resignated a lot with how we thought we would feel on our wedding day. I was a ball of nerves, however, as soon as I heard Emily’s voice and stepped into Ben’s arms, it felt like a moment in a Disney movie where everything else melted away and just Ben and I were left. A moment I’ll remember forever. I love tea and I love scones! 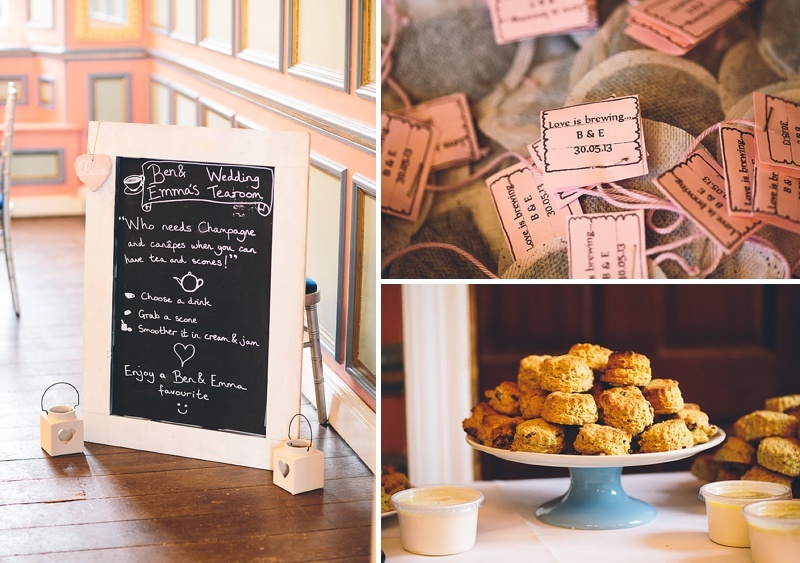 “Who needs Champagne and canapés when you can have tea and scones?” I would say… and that is what we did! A family friend made 100s of fresh scones for us that morning and a few weeks before the wedding I decided to make personalised tea bag labels… probably not the most useful way to spend my days in the run up to the wedding, but so worth it on the day! 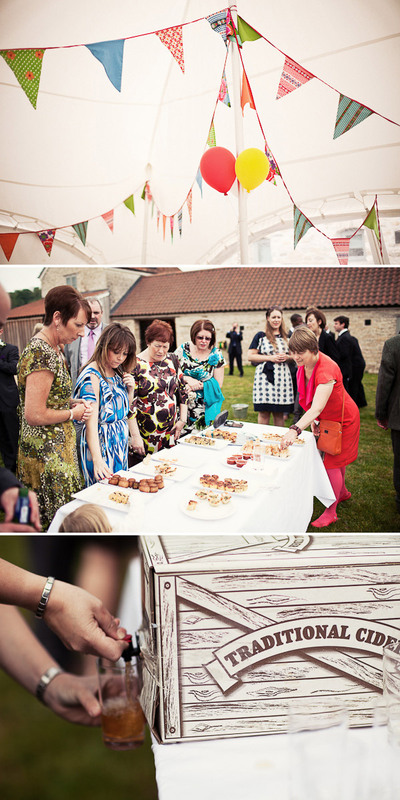 We hired a Hog Roast from Charlie at This Little Piggy Hog Roast – she was AMAZING. The quality of the food was immense and even on our nervous stomachs we managed to go for seconds! Even better, Ben had mentioned to her his love for Rice Pudding, and despite this not being our wedding desert (which was a choice of apple and blackberry crumble or Summer Fruit Pavlova) she had remembered and on the day produced a personal portion for Ben and his dad – a highlight of their day I am sure! I cannot recommend her more highly as a caterer. In the evening we had prepared a luxury buffet full of cheeses, grapes, crackers, fresh bread and my uncle’s home made pate! We also had a sweetie booth – I always like to celebrate by eating pick’n’mix, so why not continue the tradition for the biggest celebration of our lives! My Great Aunt made our wedding cake as a wedding gift and what a beauty it was! We saw a cake we loved whilst window-shopping in Oxford, we took a snap and she created an even more amazing version of it – she is a superstar! Ben and I designed and made our own wedding invitations (which featured a hand drawn map of how to get from A to B, but also our favourite locations around Cambridge and even our first kiss destination!). We also designed our order of service and my Mother-in-law painted everyone’s names onto brown luggage labels for table places – (Etsy and Ebay were a dream for ordering everything we needed). We covered handmade soap in floral material and tied with raffia for favours. I had the girls over to help decorate the 100s of jars I had painstakingly cleaned the labels off (I NEVER WANT TO CLEAN ANOTHER JAR IN MY LIFE!) We ate homemade shortbread, drank tea and covered jars in hessian and lace – I do love girl time! Ben found a lumberyard where we bought our table centerpieces of wood and I designed a table plan around Bens parent’s old wooden ladder that Ben painted white. Ben was a star and made wooden signs and blackboards that we used around the venue. 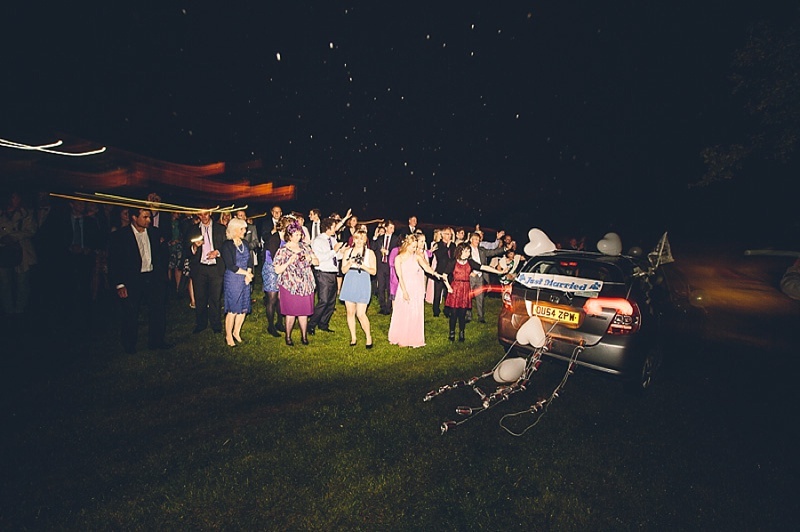 Aeroplanes had to feature at our wedding reception. Ben works as an aerospace design engineer and his main passion (after me of course!) is aircraft. Table names were therefore an easy decision and featured British aircraft from across the decades! Using chalk we wrote the titles of the legendary aircraft onto slate coasters. 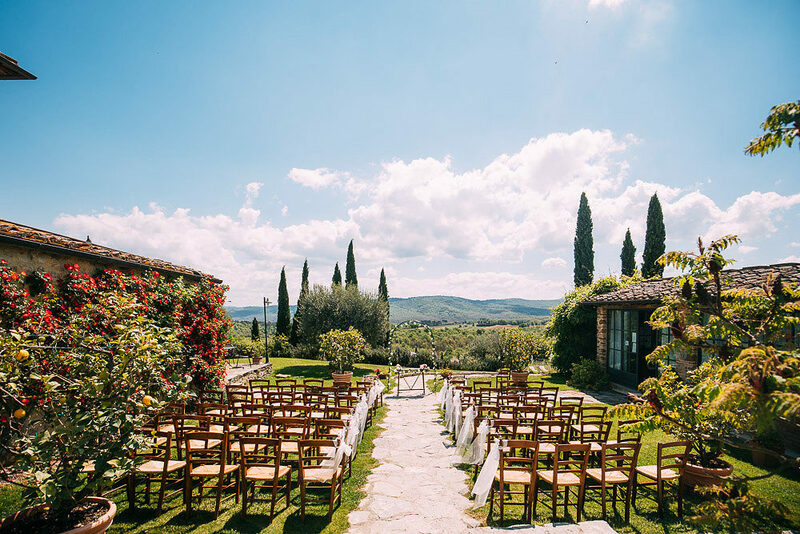 If I could go back I would recommend taking time out together as a couple weekly where you make it a rule not to talk or do anything wedding related – no matter how hard! If you are a hands-on bride that finds delegating difficult like myself…delegate anyway – I wish I had earlier on in the planning. On the big day itself, take time out to just be the two of you throughout the day, as little and often as possible! It is those little moments where we could just jump with excitement, kiss or just stare into each other’s eyes without anyone else around that really stand out for us. It has helped us to remember the rest of the day clearly, as it meant we had time to process as we went along! 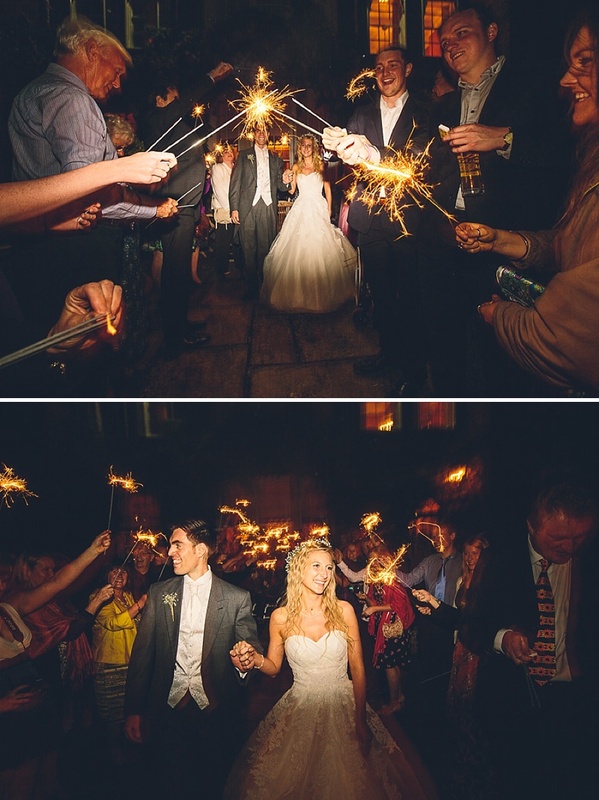 If you can get hold of 100s of sparklers, do it!!! It was a magical end to our day seeing all the people we loved line the path leading to our ‘getaway car’ whilst forming a tunnel of soft sparkling light as we walked to our future as Mr and Mrs! Our photographer, Albert suggested that we took time out with him throughout the day for ‘couple shots’ and this was the main reason we did have time together little and often…HE IS AMAAAAAZING and we cannot recommend him more. He is so discrete that one guest even asked us after the wedding “did you have a photographer?”, yet he takes the most amazing natural photos that we shall treasure forever. 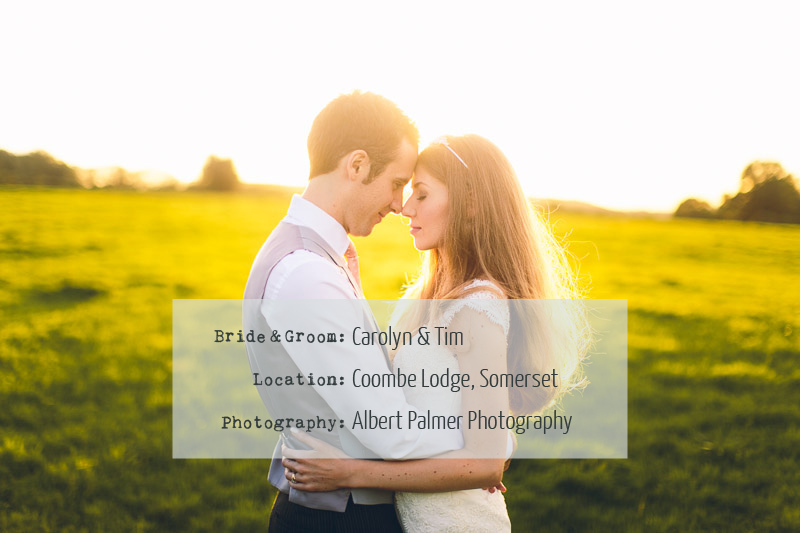 I spent the first 2 months searching through magazines and Rock My Wedding, looking at every photographer’s website (yes – everyone’s!!) and we both fell in love with Albert’s work. Asking Albert to take our wedding photos was the best decision I made since I said ‘yes’ to marrying Ben! You’d never guess Emma had fake tan on and the lashes look very natural too. 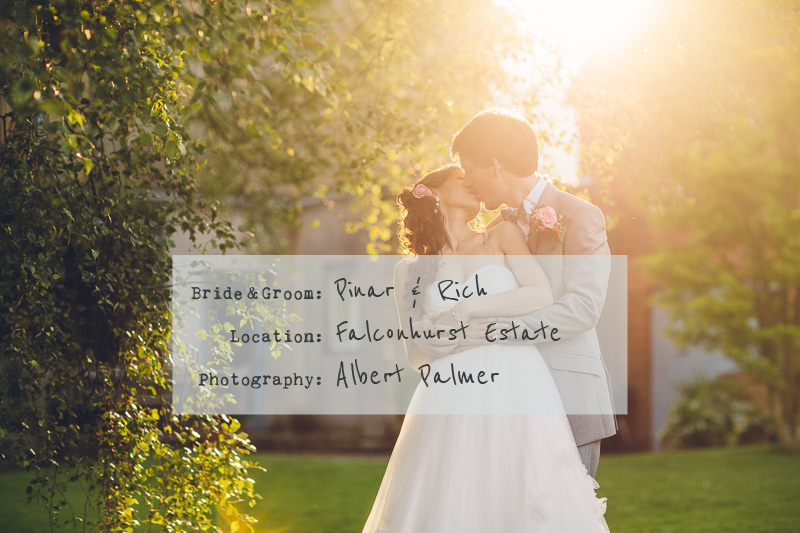 Pinar and Rich married at Salomons near Royal Tunbridge Wells in Kent on a glorious summer’s day last year and then partied on down at Falconhurst Estate near Edenbridge. 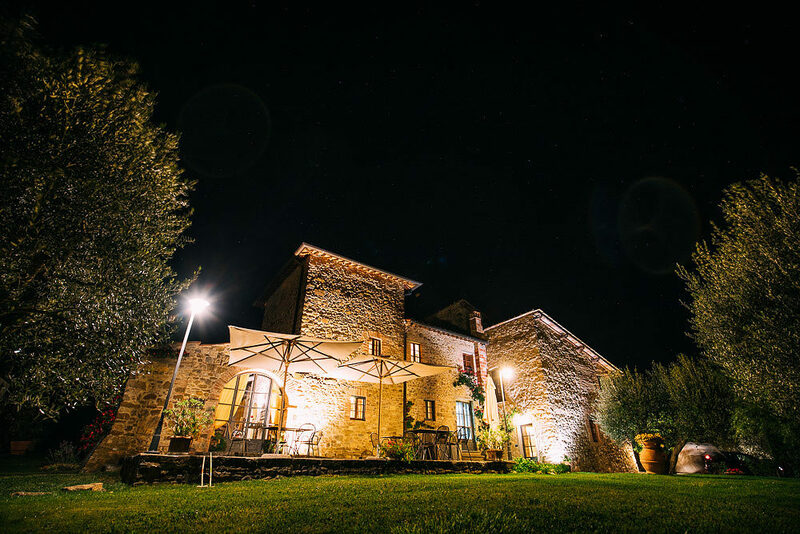 Pinar and Rich’s reason for choosing their reception venue is hopelessly romantic. They told me that they chose Falconhurst because it has the most amazing garden of flowers and fields that go on for miles and look as if they connect with the sky. 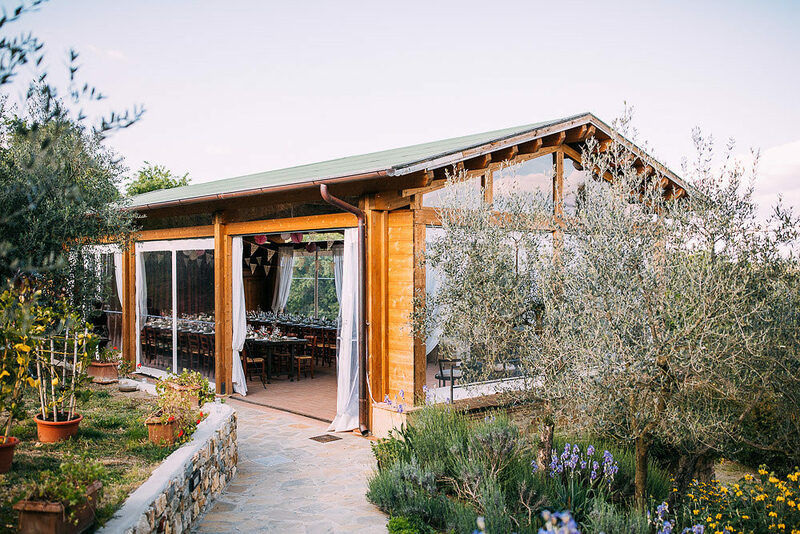 As Pinar is strongly connected to her Turkish Cypriot roots, both she and Rich wanted to create a wedding that reflected both of their cultures. The result is a glorious fusion of Turkish decadence and English charm. Pinar The Bride: Despite visiting lots of fairs, second-hand shops and online stores, I still hadn’t found anything until six months before the big day when I came across an amazing bridal store called Blackburn Bridal in Blackheath. Mandi and Sama from the store were so honest with their opinions which made the process so much easier! As I didn’t know what style suited me or what I really wanted I’d tried on a lot of dresses but it was only when I got to Blackburn Bridal that the dresses seemed to begin to make sense. I finally chose a Watters dress called ‘Irina’ with a long veil. 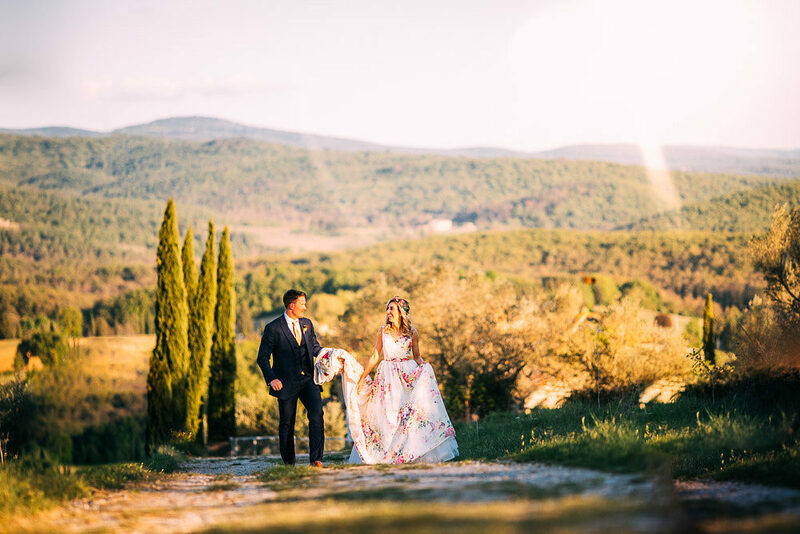 It was the small details of the flowers that were made up of intricate beading, as well as the layers and layers of the dotted tulle making up the dress and its amazing whimsical long train that I loved. I found most shoes on the high street were out of my budget. After a lot of searching online however, I finally found some amazing ivory satin platform peep toe shoes by Menbur that I bought from Amazon for not much more than £30 in the sale. They had these amazing crystal covered bows on each side of the front of the shoe that I absolutely loved. 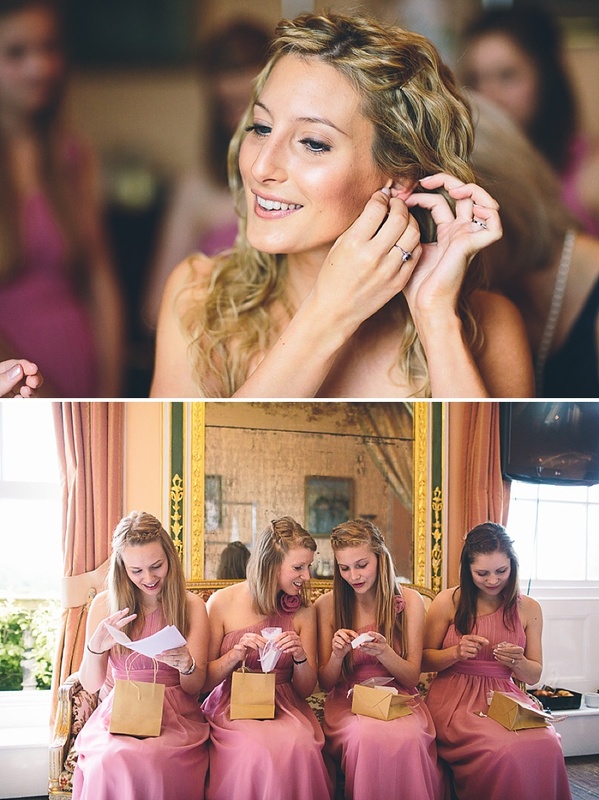 I really was in two minds whether to be brave and do my own make-up or to have someone do it for me on the big day. I really just wanted to keep the amount of makeup to a minimum but still look special for the day. I asked Ruth Burnell to come along and apply my make-up on the day after a fantastic trial with her. My hair was tweaked into place by Terry at Beauty Hut – she was fantastic! My hair was styled to one side with curls, a bit of a puff of volume on top and more curls in the back. I accessorised my hair with fresh summer pink roses; both Terry and Ruth did a really great job. We decided to get our bridesmaids flowy dresses to resemble the layers on my dress. We chose them in a light vintage pink with a cream ribbon waist and flowers on one shoulder. The dresses were designed in the one shoulder style with a beautiful heart shaped neckline that matched my dress. We got the dresses from Fever that just opened up not too long before we started looking for dresses. Rich wore a light grey three-piece suit from Reiss with a handmade bow tie from New York bought from Etsy. He wore shoes from Paul Smith which were grey with purple laces. They showed his fun side, he has a funny sense of humour and he looked swooningly dreamy. Due to logistical reasons we knew it would be a nightmare to try to have all the groomsmen wearing the same suit. We asked them to wear their own suits with a white shirt and a bow-tie to bring it all together. The bow ties were bought from Etsy and we gave them as gifts to the groomsmen from us. We also bought our dads bow-ties to tie in with Rich and his bow tie. Our photographer was Albert Palmer. Rich met Albert a while ago during a photography event and it was the first name which popped into his head when we started looking for a photographer. Looking through his work it seemed to match our style and theme perfectly. We didn’t want too many formal shots so a more documentary style was perfect capturing our friends and families emotions and feelings of the day. He really did the most wonderful job and we couldn’t have been more happy with the outcome. 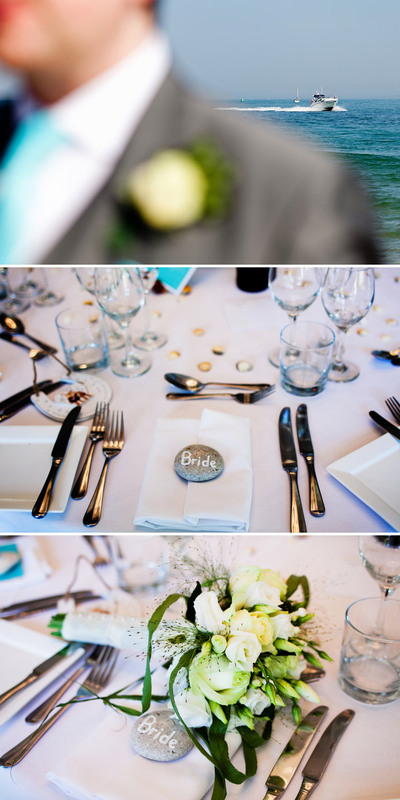 Lisa at Morganics who are local to us in Clapham Junction worked their magic with the bouquets and buttonholes. Filled with peonies, roses and antirrhinums, they smelt and looked amazing. We sourced all other flowers for the marquee from a wholesaler and had them delivered to the venue a couple of days before. A few helping hands in the form of Rich’s family a few days before the wedding helped to create the table layouts, runners and table arrangements that I had designed. For the centrepieces we used over two hundred miniature bottles that we found on eBay for £20! We first saw Andrea from Cake by Sugar at a wedding fair in London. There were a few cake stands and we ate a mini cake from each of them but it was Andrea’s cake that really stood out as “amazingly yummy”. After several discussions and a tasting session, I sketched the design of the cake how I envisaged it including flowers, dusting and flavour labels. Andrea worked her magic, and produced a combination of sponges including banana sponge with a raspberry filling, chocolate sponge with chocolate filling and vanilla sponge with raspberry and vanilla. They tasted amazing! We opted for a lot of cake so that it could also double up as the dessert. As for the rest of the food, we enlisted the help of Sarah from Elm Green to devise a menu that was the perfect fusion between English and Turkish food. We also wanted the food to be served in a way where everyone could help themselves on their tables and she met the brief perfectly. For entertainment we really wanted to have a mix of English and Turkish music. We opted for a Turkish band who played both English and Turkish and everyone really loved it. We were initially really nervous about it but we needn’t have worried. We also had a few traditions which incorporated a davul-zurna (drum and Flute player) called LPM Bohemia to play us into the marquee and another tradition of the ‘testi’ which is where all the unmarried ladies dance with a vase filled of sweets and money and then the bride smashes the vase. The pieces of vase are considered good luck for their marriages to come. We love music and it was such a hard choice to come up with one song for our first dance. In the end we chose Greg Laswell as his song reminded us of so many of our significant memories and it just seemed right. 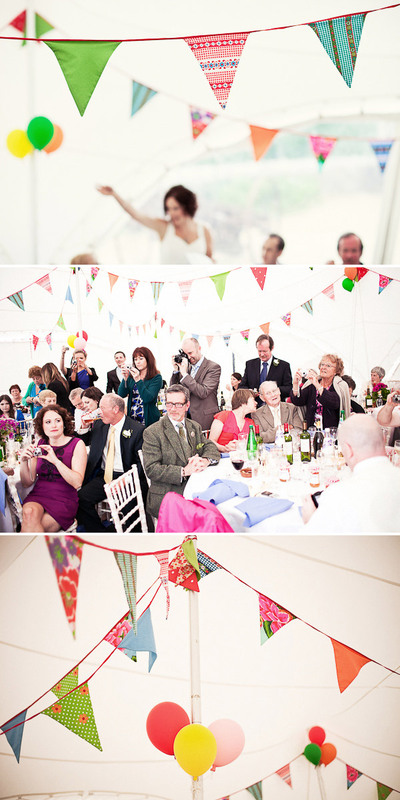 Our decor style became this whimsical woodland English / Turkish Wedding. 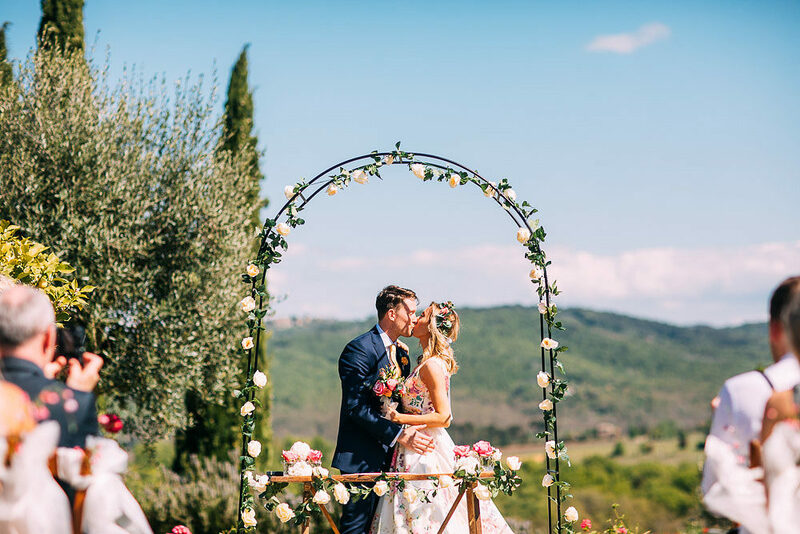 We both grew up loving the outdoors and the summer sun so we decided to go with a outdoor woodland wedding and have a marquee, festoon lights, candles and handmade elements to bring the style together. I designed our wedding invitations, RSVP’s, menus, place names and all the other bits of stationery which were all hand drawn. We screen printed the wedding invites to make them extra personal. I loved doing this so much that I now design hand drawn wedding invitations and sell them through my Etsy shop. Together with our families we decorated the inside of the marquee; it was really hard work hanging these festoon lights but when they were up and we added our pom poms to them it looked amazing! 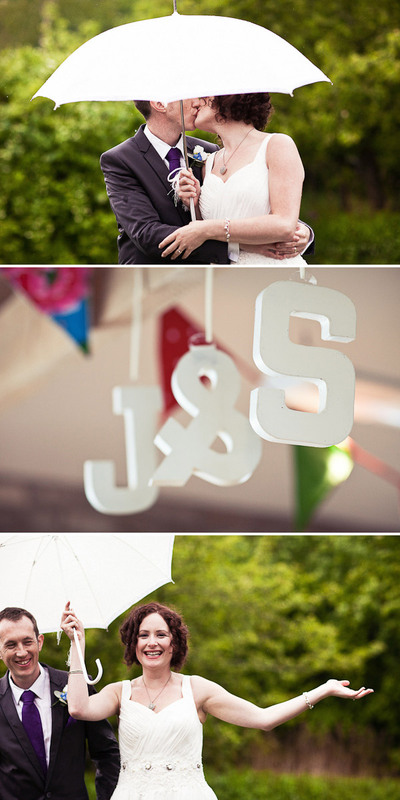 Our bunting was made by Rich’s mum and sister – it was so special to us because most the material that was used was from Rich’s grandparents so it felt like we had them there with us on our special day. For our favours we gave guests ‘Başti’ a Turkish traditional sweet and sugar almonds wrapped in little packages organised by my aunty. Our wedding was more amazing and special to us then we could have ever imagined. We decided on a set budget very early on and then concentrated on what was really important. For us it was our family and friends, the quality of the food and entertainment. Definitely go to markets, search eBay and second hand stores where you can really find great bargains. You don’t have to spend a lot to make your day amazing; it’s the people you have there that really make it special. 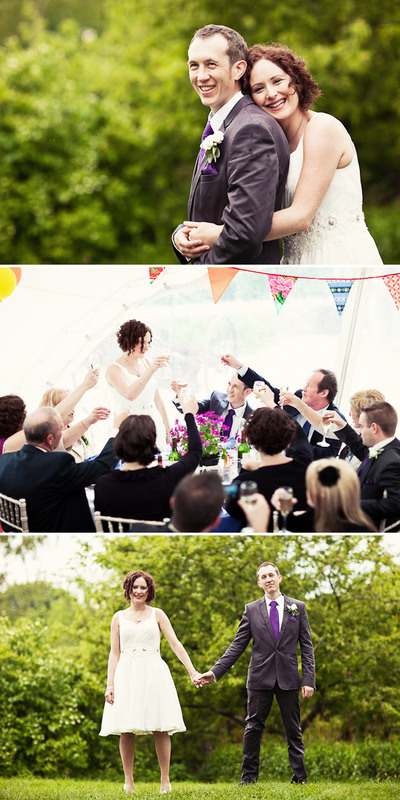 Our advice to anyone planning a wedding is to keep it personal and only do what you want and feel comfortable with. Remember it’s only one day of your life and getting there should be fun too, and after the big day there are plenty of opportunities to create more memories from your next adventures! 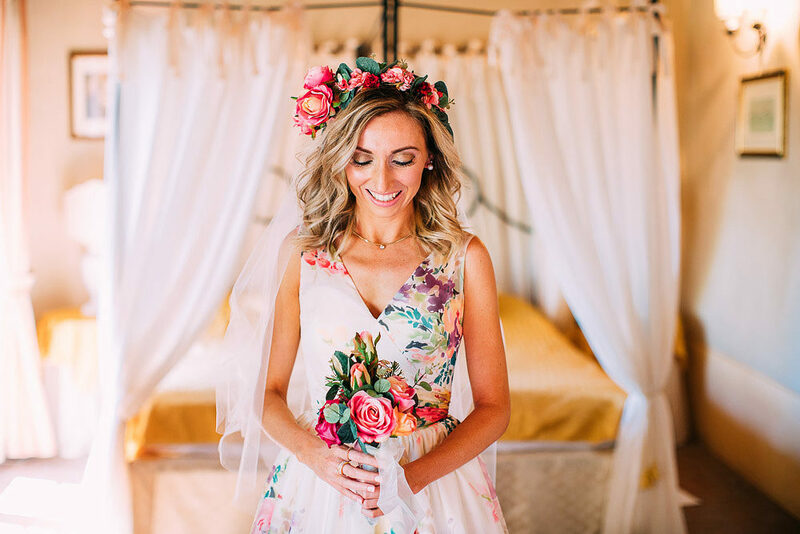 Any bride that can tuck her bouquet under her arm and make it look like a serious style statement gets serious brownie points in my book – doesn’t Pinar look absolutely exquisite ! And that cake… I love a cake that really does look as good as it tastes – well it had me reaching for a recipe book to mix up a decadent Victoria sponge complete with strawberries and lots of clotted cream anyway. Lastly Pinar’s remark that ‘getting there should be fun too’ is inspired. 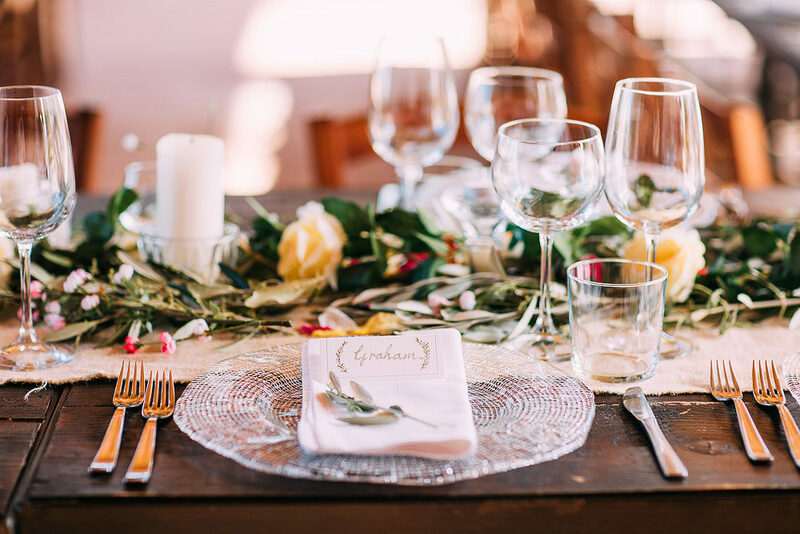 Whilst planning a wedding can be an exciting affair, it can come with its share of stress and anxiety too and it really shouldn’t be that way. Take time out from time to time on your planning journey, give your lover a kiss and remember what it’s really all about. Oh Joy! How I do love a short dress bride! It’s something about the fun factor, the youth, the flirtiness, I just love it all. There’s got to be some love for getting to flash a pair of fabulous pins. finished off by some sky-scraper beauties? No? So this wedding just fits the bill on every level. Short dress, colour and fun. Don’t get me started on that cake! 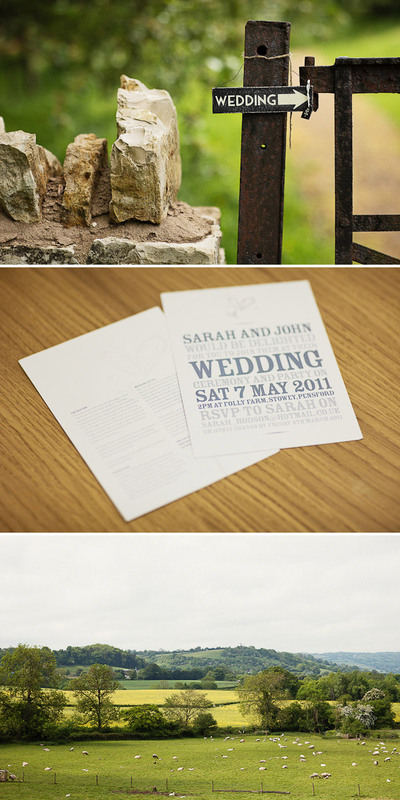 Sarah Hodson and John Robertson were married on Saturday 7th May 2011, at Folly Farm, in Stowey, Pensford. After visiting about 5 dress shops and trying on approximately 30 dresses, I hadn’t found one that felt ‘me’ enough to buy. Our venue was rustic and informal, and thought of dragging a flouncy dress behind me while I tried to dance didn’t feel right. I wanted to feel young and fresh rather than very traditional like a lot of dresses I tried. Although I’d never really thought of having one made for me there was a wedding dress designer at the end of my street so I decided to talk through my ideas with her. With Kate Garcia we talked through what I didn’t like and together arrived at an idea I loved – a short dress with a ‘shift’ style bodice with an embroidered and embellished waistband and a skirt that ruffled when I walked and flew out when I danced. 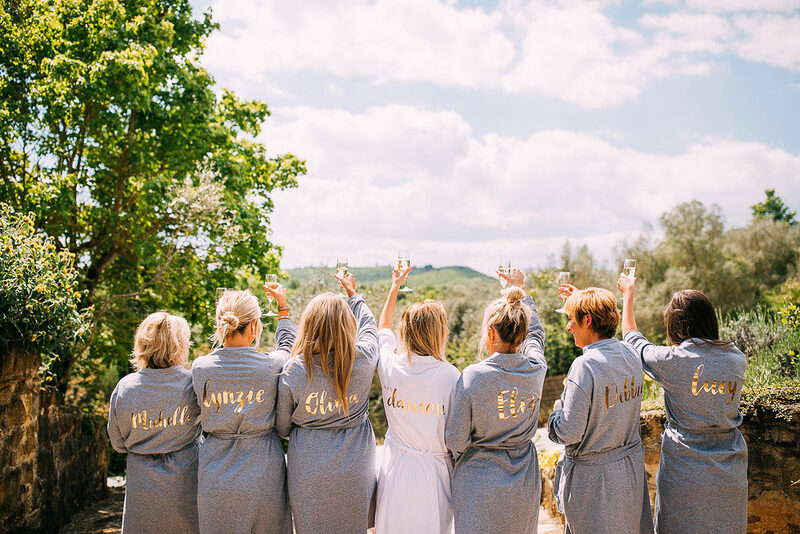 The dress was everything I wanted – it made a statement (most of my guests hadn’t seen anyone in a short wedding dress before), made me feel glamorous and special and showed off my best asset – my legs! In keeping with my relaxed theme, I didn’t want to wear a veil or have anything too fussy in my hair. Having naturally curly hair is a bonus on your wedding day, so I kept it simple with a pearl clip bought for me by my sister which matched the pearls on my dress. My Mum bought me a beautiful hear-shaped keepsake locket from The Silver Shop in Bristol which felt right to wear simply with a silver chain. With a short dress you have to have statement heels! I found amazing 4” heels from American designer Badgley Mischka from Javari Apart from having to learn to walk in them (!) 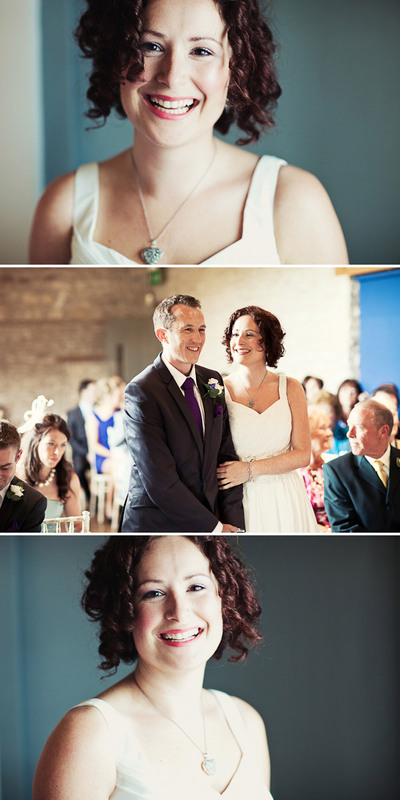 they were fabulous – gorgeous white satin with a puff of netting and really worked with the short dress. They came off mid-dance to be replaced by silver flip flops making it much easier to get around the dancefloor! Nina Norman at Space NK in Bristol did a fantastic job of not only keeping to the brief of making me look like ‘me but better’ but also made getting ready fun and relaxing for the wedding party. Fliss at Hobbs had the hard task of keeping my naturally curly hair looking natural but making it stay in place for the whole wedding. 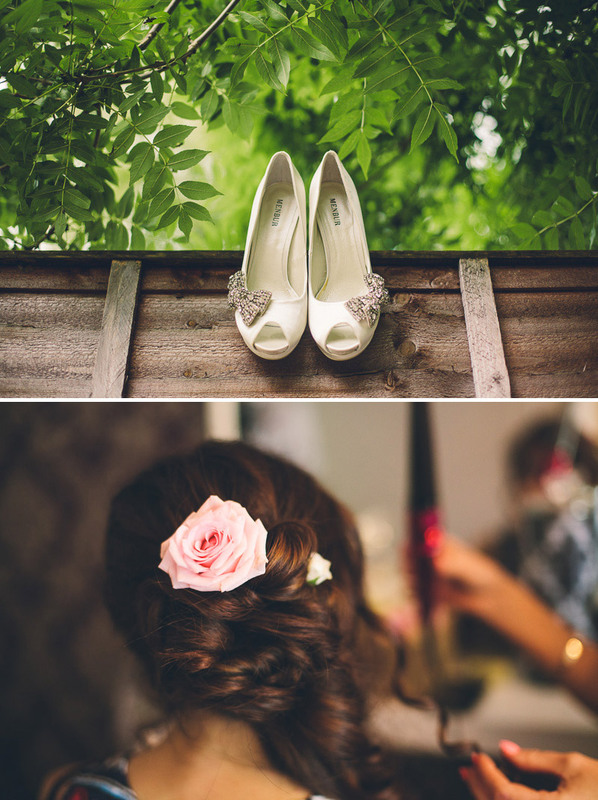 We kept it simple with a hair clip and bouncy curls, which worked well with the relaxed surroundings and short dress. 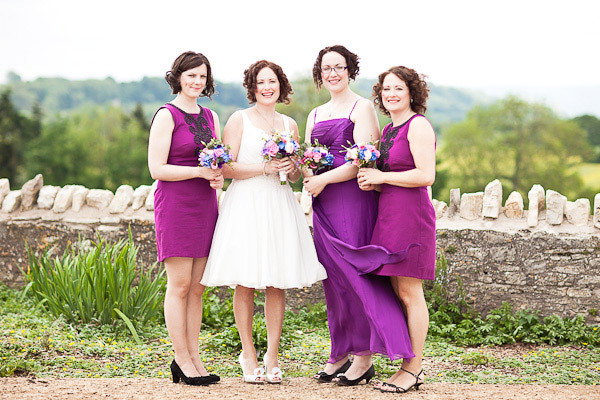 Our bridesmaids dresses came from Monsoon – the shift shape suited the bridesmaids shape, looked classic and the bright colours worked with my desire to keep things fun and simple. Our groomsmen and bestman wore their own suits. I’m not a fan of the uniform look of male wedding clothes and think letting people wear what they wanted added to the relaxed atmosphere. 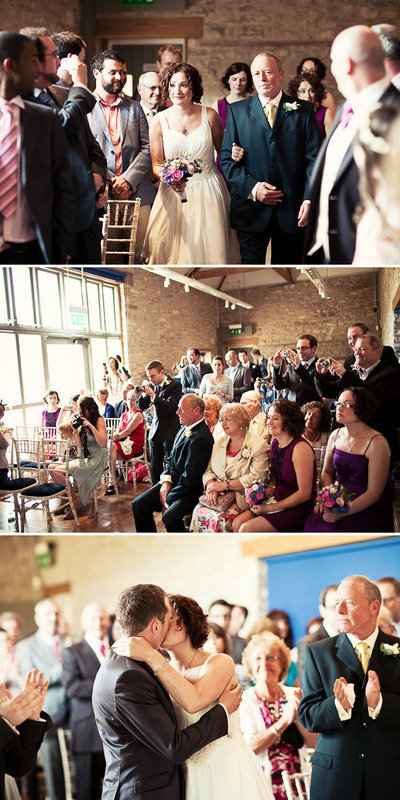 Their buttonholes were were co-ordinated with the bridesmaids bouquets with white roses. John is the stylish one in our partnership, and chose his skinny Ted Baker suit, bright purple tie and pocket square and Italian leather shoes early on when planning the wedding. Then, 10 weeks out from the wedding, he badly broke his leg. He went back to the hospital 3 times in the lead up to the wedding, each time with the hope his plaster would be removed. His last appointment was 4 days before the wedding and when we realized at last that he’d be walking up the aisle in his plaster cast we quickly took the suit to a tailor who removed the leg seam of his broken leg which allowed John to pin the leg back up with safety pins after it fitted over his plaster. It was a real talking point during the day and no one really noticed the broken leg, apart from Albert the photographer who took the quirky picture of John’s leg and stripy sock! Walking up the aisle and seeing him standing without his crutches was a special moment and was the point at which I started to cry! In keeping with the rural style, I didn’t want a traditional wedding cake. My friend Philippa is a cracking wedding cake maker. I showed her a couple of pictures of some ‘natural’ wedding cakes I liked and she came up with our incredible three-tiered sponge with lime cream cheese and red berries. It looked stunning, fitted the venue and tasted even better! How much do you want that cake? Like, NOW!